As you wind down the year, no place in your home may be feeling it more than your home office. The work papers and receipts get mixed in with the mail and the holiday cards. Before you know it, you have a mess of epic proportions. This is a busy season, but if you take the time to organize your home office now, you will be so much more productive come January. Invest a little work into your home office before the holidays, so you can enjoy them stress-free. Once you create a system for home office organization, it takes a while for you to gets used to using it. This is where labels go a long way. You do not have to have a huge list on the front of cupboards and drawers. Just a few labels that identify what is supposed to go on this shelf, cupboard, drawer or cabinet will make finding what you need very simple and quick. It also forces you to evaluate how much space you need for your files and supplies, so you can purchase more storage or office supplies as needed. When everything in your home office has a place, you are less likely to misplace office supplies. As you follow these home office organization tips, make a note of the items that you have in stock, as well as things you will need come January. Now is the time to order it, so you do not come back after some time off and realize that you are completely out of printer ink or paper. Stock up on paper, pens, sticky notes, staples and other supplies. If your computer is as disorganized as your desk, you may not realize how much this hurts your productivity. Even electronic files can be easy to lose. Create a plan for backing up your important computer files in case of a power surge or hard drive failure. Start to organize them in folders that make sense to you, like marketing, finance, sales, etc. This way, you will never lose of the original artwork for your marketing campaign or other files that are crucial to the running of your business. Now that your computer is easy to use, get to work on those paper files. If you have a lot of sorting to do, make it a quick task by color-coding your files. This way, you are not constantly looking at the folder for its contents. Use a system that works for you, such as putting the 2015 receipts in a red file and 2016 receipts in a green file. Home office organization can be an overwhelming task, particularly at this time of year. Remember that it is perfectly acceptable to ask for help. 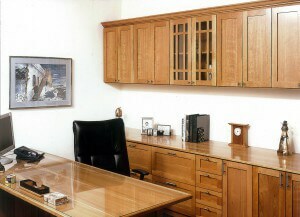 When you are ready to make your home office all it could be, request a free Atlanta home office organization estimate.